Borovets is the most famous Bulgarian mountain resort. It is situated on the northern slopes of the Rila Mountain at an altitude of 1350 meters. The resort has a perfect location right at the foot of Mount Musala (2925 m), the highest peak on the Balkans. 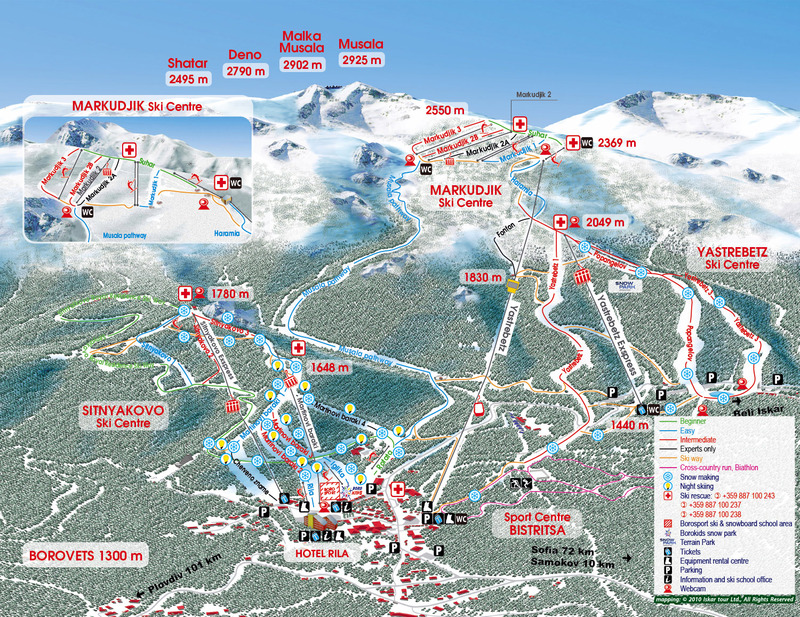 Borovets is easily accessible from all parts of Bulgaria, only 72 km away from Sofia and just 126 km away from Plovdiv. The resort has great variety of ski runs – 24 tracks with a total length of 58 km. You will be amazed by stunning snow view. The ski slopes are divided into 4 different levels according to the skill level. They are suitable for beginners as well as for advanced and expert skiers and snowboarders. The ski slopes in Borovets are divided into 3 zones: Sitnyakovo–Martinovi Baraki – starting from 1350 m altitude up to 1780 m., Yastrebets– from 1340 m up to 2369 m.and Markudzhik – from 2144 m up to 2550 m.
Resort offers excellent conditions for winter sports: alpine ski, cross country, and snowboarding. 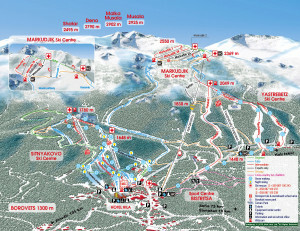 There are 58 km marked ski runs for alpine ski. Borovets has twice hosted World Cup Alpine Skiing. The resort also offers biathlon facilities for training and competitions. The cross country trails are 35 km long, designed according to the requirements of FIS (Federation International de Ski), at minimum width of 6 m.
Borovets is a modern ski resort with a lot of hotels, restaurants and bars . Central Borovets ski center – starting from 1337 m altitude up to 1780 m.
Yastrebetz ski center – from 1340 m up to 2369 m.
Biathlon facilities – in 1993 Borovets hosted the World Biathlon Championship. Ski jumping – in Central Borovets ski center.